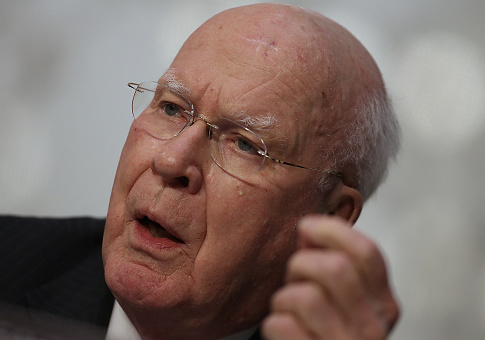 Sen. Patrick Leahy (D., Vt.) joined other Senate Democrats in arguing Wednesday that Brett Kavanaugh's records as White House staff secretary are relevant to his Supreme Court nomination, pointing to 2010 comments he made about the instructiveness of that tenure to his judgeship. However, he said in 2006 at his confirmation hearing to be a D.C. Circuit Court judge that his job coordinating document flow to President George W. Bush helped him be an "honest broker" and present policy views to Bush in a "fair and even-handed way." Democrats are demanding Kavanaugh give over every piece of paper he touched while serving as staff secretary, and the Washington Post reports such a request could number over one million pages worth of documents. Sen. John Cornyn (R., Texas) of the Judiciary Committee said Kavanaugh was essentially a "traffic cop" in the job and requesting such paperwork was unjustifiable. "When people ask me which of my prior experiences has been most useful to me as a judge, I tell them that all of them have been useful, and I certainly draw on all of them. But I also do not hesitate to say that my five and a half years in the White House—and especially my three years as Staff Secretary for President Bush—were the most interesting and in many ways among the most instructive." In 2006, Kavanaugh said of his staff secretary experience, "This is what I call an honest broker for the President, someone who tries to ensure that the range of policy views on various subjects in the administration are presented to the President in a fair and even-handed way. I've worked closely with the President and with the senior staff at the White House and other members of the administration for nearly 3 years. I think I've earned the trust of the President, I've earned the trust of the senior staff, that I'm fair and even-handed." Supreme Court Justice Elena Kagan testified at her confirmation hearing in 2010 that her tenure as President Barack Obama's solicitor general was among the most significant to her gaining an understanding that every American deserved equal protections. Elizabeth Taylor, who served as chief counsel to Sen. Tom Coburn (R., Okla.) during Kagan's confirmation process, recalled to the Washington Free Beacon that Senate Republicans and Democrats did not request documents from her time as solicitor general because of their sensitivity. "There was a feeling that the degree of sensitivity for the Solicitor General documents made it inappropriate to request them, so neither side did, and I would argue that the Staff Secretary position are even more sensitive since they're being communicated directly to the president and they can be on a variety of topics, and were not Kavanaugh's workmanship or opinion at the time," she said. Current White House counsel Donald McGahn said Kavanaugh's documents from his tenure in the Bush White House counsel's office were relevant to his confirmation process, as they were with Kagan's; she served in the White House counsel's office under President Bill Clinton. Republicans, however, point to Kavanaugh's authorship of more than 300 opinions as a D.C. Circuit Court judge since 2006, in addition to the hundreds he joined, as more relevant to his jurisprudence. Kagan had no judicial track record before joining the Supreme Court, a fact Senate Judiciary Committee chairman Chuck Grassley (R., Iowa) noted in floor remarks on Wednesday. "There was a higher need for additional information that might shed light on her legal thinking," Grassley said. "Judge Kavanaugh, by contrast, has authored more than 300 opinions and joined hundreds more. The Staff Secretary is undoubtedly an important and demanding position, as Judge Kavanaugh himself and others have said. But Staff Secretary documents are not very useful in showing Judge Kavanaugh’s legal thinking." This entry was posted in Politics and tagged Brett Kavanaugh, Patrick Leahy, Supreme Court. Bookmark the permalink.